Teton Sports Scout 3400 internal frame backpack – Orange. This review is about a very popular pack, Teton Sports Scout 3400 Internal Frame Backpack Mecca Orange. When it comes to price it is hard to find any brand that can match Teton Sports backpacks. From this review, you will see that this pack has many great features which explain its popularity. Presently this is the best selling pack on Amazon. The number 3400 in the name denote the volume in cubic inches, which is equivalent to 55 liters. 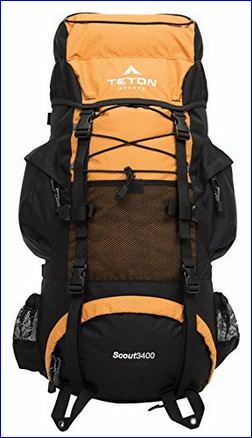 This is a pack with an internal frame and with full torso adjustability. This is achieved through a velcro on the back, you can see it here in the picture. 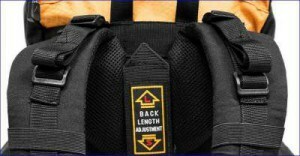 When you detach the velcro, you can slide the harness up and down to fit your torso length. The shoulder straps are well padded and you have a chest strap between them. On the hip belt, you have a very similar and rather thick padding. The lid itself contains a zippered pocket accessible from inside when you lift the lid. On the top of the lid, you have one very useful compression bungee mesh to put a jacket, fleece, or anything similar. You have yet another external, zippered pocket on the lid. All nice features indeed. Inside the main compartment, you have a water bladder sleeve for up to 3 liters of water. The single opening for the water hose is on the back side of the pack. Bungee mesh on the front. The lid clips go to the front face of the pack. Here again, you have one compression bungee mesh to store things when you are on the go, see it in the picture. Farther below you have another mesh pocket on the front, quite small, perhaps only for items like maps. On the bottom, you have a zippered entrance to the bottom compartment. The divider between the two compartments is zippered so you can open it when needed and this will give you one large compartment. There are 2 compression straps over the bottom compartment and they can be used to attach a sleeping pad or a sleeping bag. 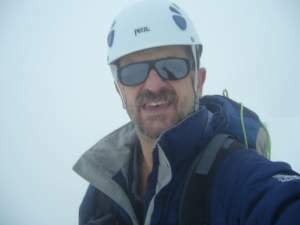 You have a pair of attachment loops on the bottom, for an ice axe or walking poles. On both sides of the pack you have added large zippered pockets, you can see them in the first picture above. They are designed similar to what I have seen in High Sierra 90 pack. They do not take space from the main compartment when you put stuff in. I think this is a good feature. I have something similar with my own old Deuter Futura, but those pockets do take space of the main compartment. Below, you have the usual mesh pockets for water bottle, one on each side. Completely on the bottom, you have a velcro pocket with an integrated attached rain cover. Teton Sports Scout 3400 internal frame backpack hunter green. Weight: 4.5 lbs (2.41 kg). Volume: 3400 cu in (55 liters). Fit torso: 15 – 19.5 in (38 – 50 cm). Hydration compatible; fits up to 3 L water bladder (not included). Front and top bungee stash storage mesh. All these specifications apply also to Teton Sports Scout 3400 internal frame backpack hunter green model, see it here on the right. Reports of chest buckle and chest strap problems. Reports with buckles that broke. This pack is nicely rated by Amazon customers, and the number of customers is enormous. A few complaints of users I have summarized in the cons given above. As you see from the table, the basic features look very similar. However, there are substantial differences in the quality of these packs. So in spite of such an obviously great price of Teton Sports Scout 3400 backpack, I rate it lower than other packs. Please follow the links to see the differences. 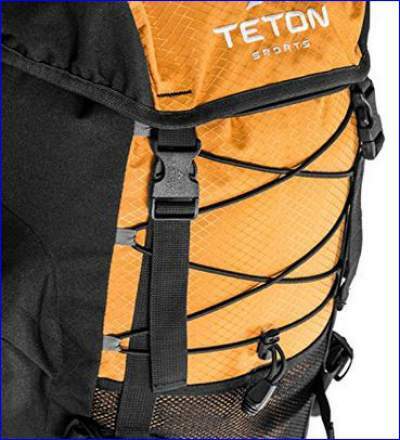 To conclude this review of Teton Sports Scout 3400 Internal Frame Backpack Mecca Orange, this is a popular pack and there are reasons for that. Most likely the price is the most important factor for its popularity. The comparison table above shows that it has similar features as the best packs on the market, and this all comes for 1/3 of the usual price. For updates about the price please follow the links. If you find this text useful please share it with others. 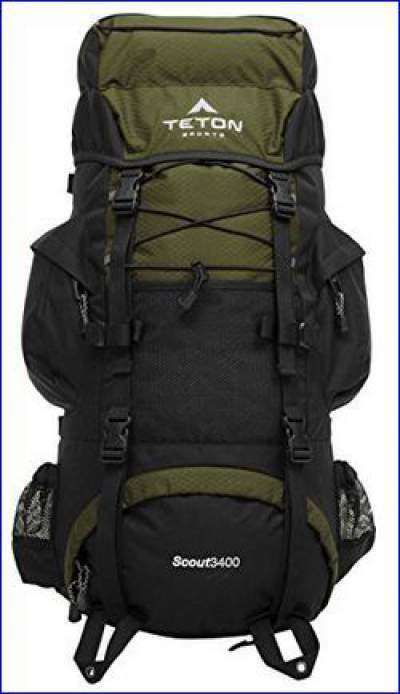 You might want to see yet another pack from the same brand Teton Sports Hiker 3700, with great features and price. Check also this Wasing 55L backpack with an incredibly affordable price. Thank you for reading, I shall be happy to have some comment from you in the comment box below. Wow I think I have reviewed this site before, but this post is really-really good! I like how light the backpack is, I’m looking for a good pack to take when I go on my mountain biking trips. Hi Thad, thank you, great to hear from you. So the text has been helpful, I like to hear this. All the best. I’ve got a tramping event coming up very soon. The Teton Sports Scout pack looks like a great buy for me. I certainly like the price. Despite the common complaints I think it’s still worth the price. I’ve had a look at your comparison chart also and the Teton Sports Scout pack has some really awesome features. Thanks for sharing, I’m sold! Thank you Michelle, I am happy to hear that the about this Teton Sports Scout pack has been useful to you.